Keeping your pet’s teeth healthy is one of the best ways to keep your pet living longer, happier and healthier! 70% or more of pets over the age of 3 years have dental disease. For some, it’s just gingivitis and a little plaque, but for many, dental disease has already advance to early or even later stages of periodontal disease. Check your pet’s mouth at least monthly for redness around the gums, bad breath, or yellow to brown calcified plaque on the teeth. Don’t forget to check the teeth Waaaay back under the outer corner of the eye—this is where most dental disease occurs! This is the ideal way to prevent dental disease in dogs and cats. It does take some training (Blog on training to tooth brushing), but it is soooo worth the effort in the thousands of dollars you will save in professional cleanings and dental treatments once disease sets in! Use a pet toothpaste. We like C.E.T brand the best. It comes in a variety of pet-friendly flavors like chicken, pork and mint (more human friendly, really). It also has enzymes that work to break down the plaque even after brushing time is over. It’s also edible—unlike human pastes. 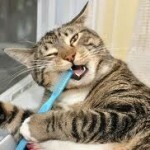 Don’t use human toothpaste in your pet’s mouth!. 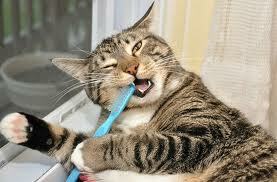 Pet toothbrushes are very helpful as well. Angled bristled brushes are the best for getting to those back teeth and the bristles get the job done. But, you can start with a finger brush—again bristles work better than the rubber “bristles”, but something is better than nothing! Dental diets are known to reduce dental tartar by up to 80% ! They are also impregnated with enzymes that help to break down oral tartar and also help to bind the calcium in the saliva that causes the hard, calcified tartar referred to as “calculus”. What could be an easier way to help keep your pets mouth clean than simply feed them a diet that helps do the work for us!?! Oral Hygiene gels and liquids. Again, pick either a CET product, a VOHC certified product* or something recommended by your veterinarian. These are best applied directly to the teeth with either a brush or a sponge-tipped cosmetic applicator, so they require some cooperation from the pet. Some products, like CET Oral Hygiene rinse is designed to be squirted into the cheek pouches. These product essentially minimize inflammation in the mouth by periodically reducing oral bacterial counts. Greenies™ are the best known to be effective, safe (reformulated to be safer than original product), and attractive to dogs. I usually recommend picking a size larger than recommended on the package to encourage more chewing activity. These are certainly helpful. Supervise your pet to ensure he isn’t eating giant pieces, even though they are “edible”. C.E.T Chews for dogs are enzyme impregnated rawhides that are also a nice chewing option. Keep to just 2-3 rawhides a week though, to avoid digestive upset. Cat C.E.T Dental Chews actually require the cat to CHEW, unlike a lot of the other cat “dental” treats that most cats (certainly mine!) swallow whole! They don’t do any good if the kitty doesn’t chew on them! *Look for a “VOHC” (Veterinary Oral Health Council) seal on the product. These products have actually been tested and proven to reduce tartar accumulation. Anyone can market a product and there is no regulation as to effectiveness. But, a VOHC Approval seal gives you confidence that a particular product has been clinically tested to be effective.